"If like Poland you're not ready for the onslaught, you too could be ruthlessly torn apart and partitioned between rival dictatorships! Let Bobbs-Merrill intervene on your behalf." This is from an interesting article by Patrick J. Charles on the topic of legal-publishing ads during wartime. 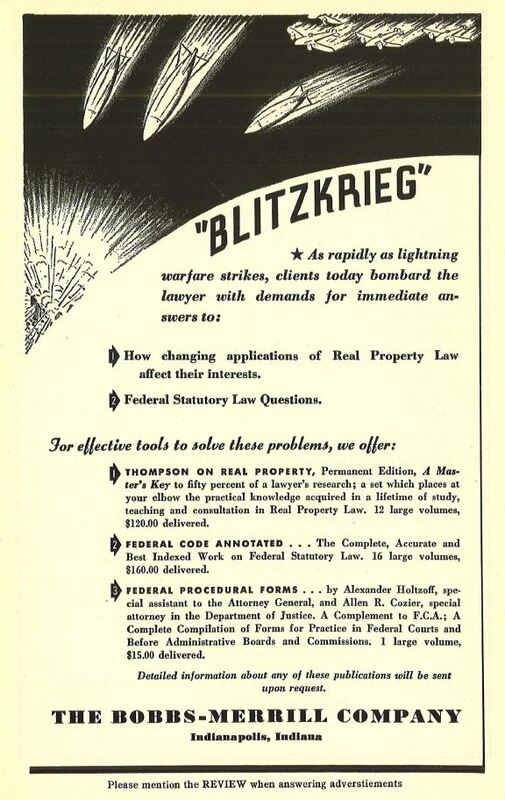 That is, these aren't law-firm ads—I think maybe firms did not engage in anything as low-brow as "advertising" at the time—but rather ads for legal-publishing companies. The ad above is said to have appeared in 1940, the same year a large group of Germans toured Denmark, the Netherlands, Belgium, and then France. (Most of the same people had previously visited Poland.) Blitzkrieg ("lightning war") was therefore a familiar term at the time, but it seems just a bit over the top to compare it to the brutal onslaught of client questions. The ads comparing Shepard's Citations to a "sweeping searchlight" during a blackout and describing Corpus Juris Secundum as a "weapon" are also pretty bad. Special judge's prize goes to West Publishing Company for (in 1945) comparing its Words & Phrases tool ("the 'One-Minute' Method for finding the elusive case") to the atomic bomb ("the 'One-Minute' Method for the winning of a war"). Yes, it's just like that.